Furniture and upholstery is just as vulnerable to spills, dirt, oils and other contaminants as the flooring in our homes. We spend much of our time relaxing on couches, sofas, chairs, and other furniture and as a result dead skin, body oils, and spills cause a build-up of stains and grime to form on the furniture. 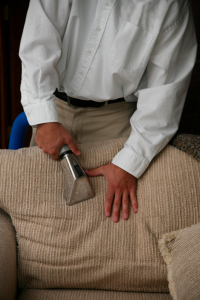 Having your upholstery professionally cleaned not only restores the appearance, it also provides some health advantages as many allergens, and pollutants are removed. Hot water extraction (aka Steam Cleaning) is the most commonly used and recommended cleaning method for most upholstery made today. Steam cleaning is the most thorough method because cleaning agents are able to penetrate the fabric and reach where dry cleaning solutions can not. However, there are some delicate fabrics that are best cleaned with low moisture, and at Mighty Clean we have the experience to determine which method is best for your home’s fine fabrics and upholstered furniture. Every piece of upholstery is unique and needs to be inspected by a trained professional cleaner before beginning any cleaning process. Many different types of stains can be found on Furniture. Removing a stain from one fabric is different from removing the same stain from another fabric type. No one cleaning agent does it all. As we have mentioned many times, the worst stain is the one that was not treated immediately or was treated with the wrong solution or method and has set the stain in. Mighty Clean technicians are trained professionals and can select the appropriate methods for removing the stains from your upholstery. Inspect and determine each type of fabric, note the soiled areas and go over the findings with you. We will explain any problem areas, determine the process that will yield the best results, and let you know what you can expect after the cleaning. Thoroughly Pre Vacuum, an important step often skipped by cleaners. During this step much of the dry particulate soils, hair, and dust are removed providing a better end result. Apply the cleaning agents and allow time for the breaking down of the soils, oils and stains. Often the cleaning agent must be agitated to assist in penetrating the contaminates surface and breaking them down. Rinse and Extraction of the cleaning agents and all contaminates from within the fabric. In this step we make sure to remove all cleaners and soils so no residue is left that could cause the fabric to re-soil more quickly. Use air movers to speed dry fabrics.